Swanson DHEA offers a broad variety of rejuvenating benefits both for men and women – improves bone and joint strength, enhances the sexual function, and delivers vital energy. It is a natural predecessor of testosterone and oestrogen. Each capsule contains 25 mg of DHEA. 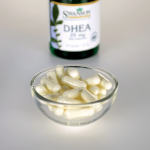 Breathe new life into your body with the hormonal support of DHEA –nature’s age-combating weapon! • The benefits of the anti-age products which will preserve your best appearance. • Superb for maintaining healthy sexual energy. • A natural estrogen and testosterone precursor.